Let’s visit Victoria Falls, located on the Zambezi river between the countries of Zambia and Zimbabwe. 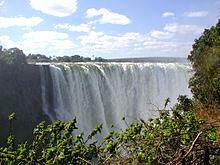 Victoria Falls is considered to be the largest curtain of falling water in the world. It’s about 1.7 km (1 mile) wide and 108 meters (360 feet) high. Are you wondering how big that is? Imagine a wall of water that is about as high and wide as 20 soccer fields lined next to each other! That’s a lot of water! The local people call the falls “Mosi-oa-Tunya”, “the smoke that thunders”, since the falling water makes a very loud sound and the spray from the water rises very high above the falls and looks like smoke. A very popular activity is bungee jumping from a bridge in front of the falls – it’s like jumping off a 25 storey building! You can watch a video showing Victoria Falls here.